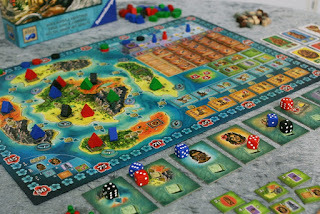 Bora Bora first caught my eye when I was researching more into the Alea Big Box Series. I very much enjoyed “The Castles of Burgundy” which was number 14 in the series. So when I saw that a new one was scheduled to be released – and from the same designer no less ! – my interest was piqued. 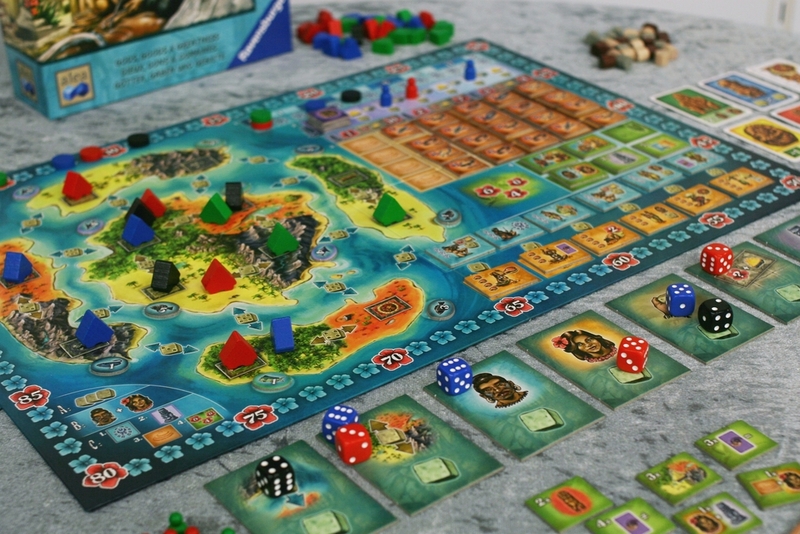 In Bora Bora, players are competing to score the most points through a variety of ways which, in essence, could count as many mini games within a giant game. The theme is about men and women on an island, trying to do… you know what, its really not that thematic. I don’t have any way to describe what these people are trying to do or what the game hopes to convey. Regardless, let me tell you what I think about the game as a whole. 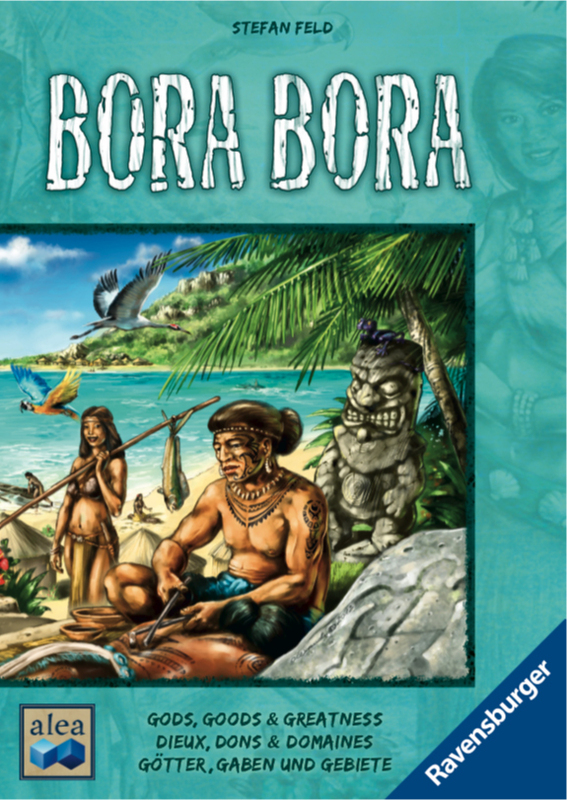 Bora Bora is played over 6 rounds. 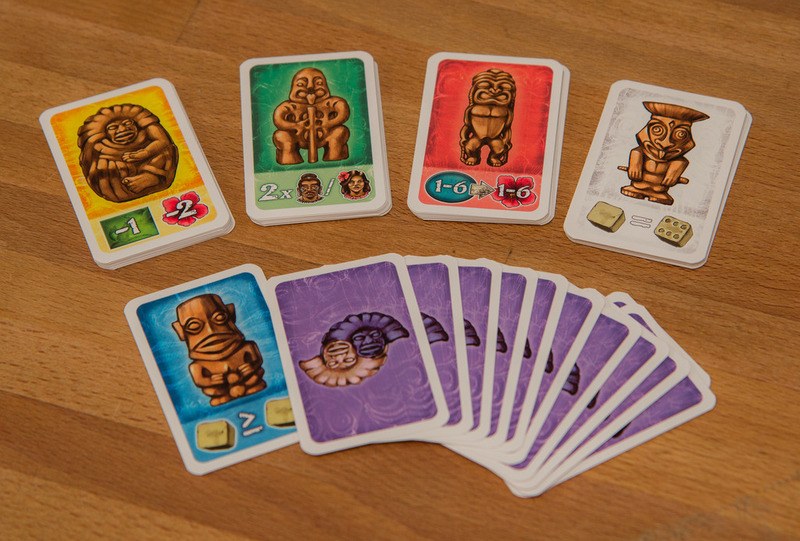 Each round, players will roll 3 dice and use them as workers to activate actions on the board. The pips on each die rolled is crucial as it determines how good an action you can perform ( a higher number usually results in a better action ), and whether a player may perform the same action after it has been taken ( players may only perform an action that has already been taken if their die value is lower than the previous player’s die ). After 6 grueling rounds, the game ends and players will tally up their end game points and any bonus points they receive by fulfilling specific end game goals ( every player may fulfill these goals independent of each other ). The player with the most points is the winner. Bora Bora is a strange little game. It takes many different little mechanics and joins them to become one big game. The different parts of the game are simple in nature, but once put together, can really drive a person insane. And this is also evident in my feelings about the game. There are many little things that I like about it, but also many things I dislike about it, and when you put them all together, I still cant tell you whether I truly love the game or not. I love the tension in the game. Where each turn you are closely watching what the other players want and whether they even have the ability to get what they want ( or stop you from getting what you want ). I end up standing for most of the game because you constantly want to see what everyone is doing and how it eventually affects your position in the game. 3 dice is all you get, and that’s 3 dice too little. 2) Everything ! I want ( need ) Everything ! 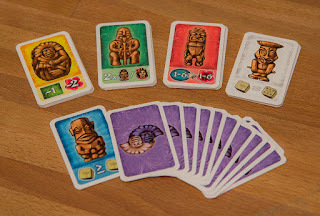 If you have played Stefan Feld games enough, all his games have nearly one thing in common, you want to do EVERYTHING. Like, seriously, you will feel like you wish you had 10 dice to do things. In Bora, I feel exactly like that. I want to expand my colony so I can add this person ( 2 actions ), then I want to get ahead on the temple track ( 1 action ) so I can get a free God tile, which I will then use to… ( MOAR Actions Please ! ) You get the point. You don’t have to look very hard in Bora to find a way to score points. They are everywhere. Do this, 10 points, do that instead, maybe 4 points, buy a jewelry, more points. Points everywhere ! To win the game, you need to find the best and most efficient way to score. The game incorporates “special abilities” in the form of the Male & Female tiles. Each tile gives you a special action that only you can do, and for free once per round. I love special abilities. Even better still, the game lets me pick and mix whichever ability I so desire. This makes each game feel fresh and different. If I’m not in the mood for abilities, then I can completely ignore them and do something else. The tiles are possibly my favorite part of the game as of right now. The God cards and tiles are my 2nd favorite aspect of the game. They let you break the rules of the game provided you can afford to pay the cost to use them. These cards are the sole reason that Bora is no longer an open information game. You may see the dice someone has and think that they cant do a particular action, but one God card can change that entirely. Without theses cards, I think the tension is Bora drops significantly. The cards also afford you great flexibility and options to your game strategy. Love. I find that Bora does not have multiple paths to victory. There are multiple things you can do, there are multiple things you want to do, but at the end of the day, you have to invest in most of these areas. You may forgo one area or two, but you will likely find yourself doing everything, perhaps in small bursts. So the game each time will feel very similar. And this is a no-no for me. Different = Good. Same = Not as good. I tend to prefer games which let me try different things each time. The game at the start already tells you how the game should roughly be played. This is done by the task tiles given to you, and also how the scoring of the game happens. What I mean by this is that, the ceremonies should be done first, and the temples last because they give you various points during various rounds of the game. To do them the opposite way ( temples first, ceremonies last ) is a sure fire way to defeat. The task tiles, though you don’t have to complete them, failing to complete less than half of what you receive will likely spell your doom. So in a way, what you get in the game is what you are aiming for. Which, for me, isn’t really into my style of games. The different areas of Bora doesn’t really mesh well into a single game. I do feel that some of the actions are disjointed and that does take me out of the game somewhat. I love thematic games – though I don’t need all the games I play to be thematic – but even without a proper theme, the gameplay elements definitely seemed forced together. Some of the areas ( temple and ceremonies for example ) seemed tacked on so that there are more things to do and more ways to score points. And in the end it doesn’t make the game flow as well as I think it could have. So there we have it, more good than bad. I guess that should mean I pretty much like the game ? Well, I do I guess. I like it enough to keep playing it, and I won’t really refuse to play it if someone suggests it, but its not one I would add to my collection unless I can find it at a pretty good deal. For me it shines with the tension, the interaction, and the way it makes me use my brain till its limit to find the surest and sweetest way to victory. But it falters to reach its potential ( of being a great game ) by being a little samey, and perhaps a little too linear in its way of being played.